If you ever find yourself near Los Gatos, California, a small town in the Silicon Valley just south of San Jose, you should take the time to stop by. The town is charming, full of Victorian houses, a vibrant shop-filled main street and many excellent restaurants. 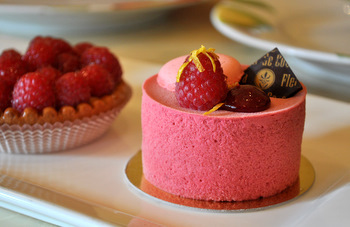 It is also the home of Fleur de Cocoa, a wonderful French chocolate shop and patisserie that is well worth a side trip if you’re in the mood for a little indulgence. 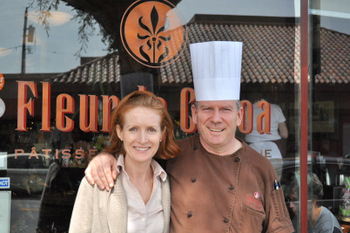 Fleur de Cocoa was opened 12 years ago by Chef Pascal Janvier and his wife, Nicola. 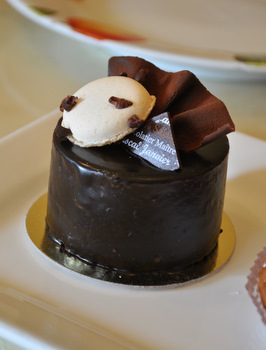 It has an extensive menu of handmade french pastries – from simple croissants to elaborate multi-layer mousse cakes – and a wide selection of handmade chocolates. Chef Janvier began his career in France with an apprenticeship at age 12, and followed that up with a Master’s Degree in chocolate, ice cream and pastry and a long career both working with, and teaching the art of the chocolatier. In short: this guy knows what he is doing when it comes to both chocolate and pastry and it shows in every product they sell at the shop. 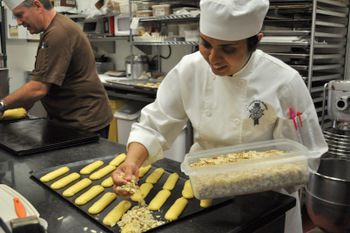 The day starts out with freshly baked croissants in a variety of flavors, all made from scratch every day. 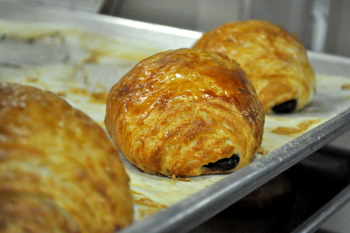 The almond croissant is a customer favorite, but I saw plenty of pain au chocolat flying out the door, too. Coffee and hot chocolate are also morning favorites. The hot chocolate is my favorite kind: thick (but not too thick) and very chocolatey without being too sweet. 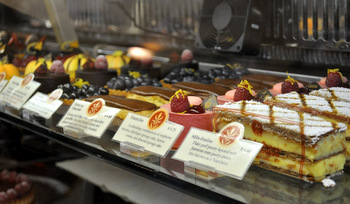 After breakfast, this shop is all about desserts. 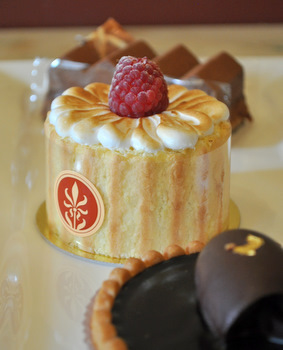 The pastry case is packed with beautiful, single-serve treats in every flavor you could imagine, many with a chocolate base (or at least a chocolate component) and featuring local, seasonal fruits. 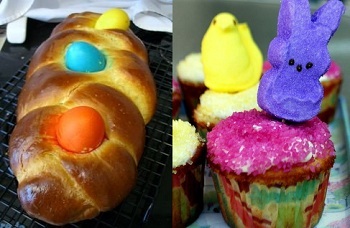 Again, all are handmade and made fresh on a daily basis. There are fruit tarts, chocolate cakes, white chocolate mousses, eclairs in multiple flavors and classic cream puffs – just to name a few. I’m going to take a moment here and thank Chef Janvier, who was kind enough to allow me to get a sneak peek into his kitchen to see him and his staff at work on the morning I visited. He also shared a few of his culinary secrets, such as the fact that the pans he uses for choux pastries are not your standard aluminum sheet pans, but are heavy duty sheet pans from France. 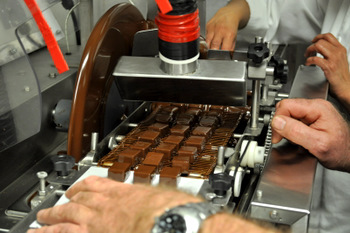 In addition to the baking, all of the chocolate sold at the shop is made there. A whole room in the back of the kitchen is dedicated to chocolate – and you wouldn’t believe the volume of chocolate that comes out of this one small room! 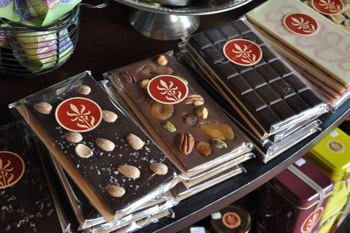 The shop has dozens of flavors on their menu – some seasonal, some year-round – and there is something for every taste. Only high quality chocolate and other ingredients are used in these pralines and bon bons, and they’re constantly turning over so you know that every single piece you eat is fresh and at its peak. 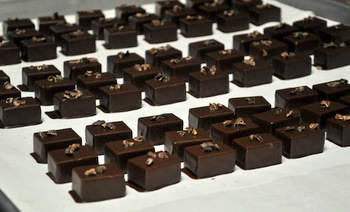 Along with the individual chocolates, there are chocolate bars, chocolate sauces and some other confections available. 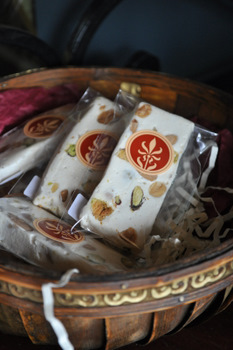 The fresh nougat was a delicious surprise, and I spotted a few flavors of madelines for those who like to dip them in their espresso. 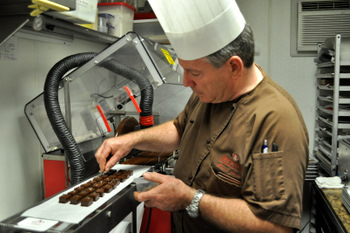 One of the most unique things about Fleur de Cocoa is the Salango chocolate that Chef Janvier uses in many of his products. This is a custom blend of chocolate that he personally developed with chocolate maker Barry Callebaut (after a rigorous process of mixing, blending and taste testing different chocolates from different parts of the world) and it can only be found at his shop. The dark chocolate is just over 70% cacao and it has a very smooth, rich flavor that is reminiscent of deep chocolate brownies. 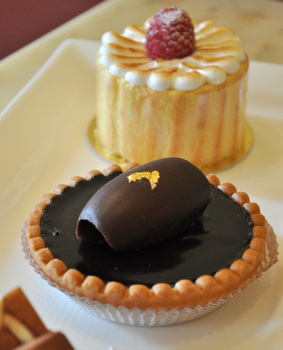 The ganache made with it is outstanding, and there are some desserts (pictured below) that feature it, as well. I’d go back for the chocolates or the croissants alone, but I have to say that nothing could be better than getting one of the first canneles still warm from the oven after Chef Janvier has made a fresh batch. 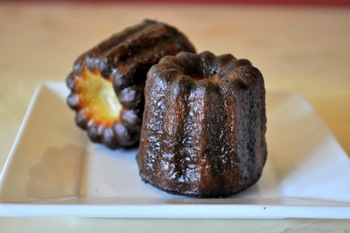 Canneles are a very unique type of French pastry that is sometimes referred to as a hand-held creme brulee. They have a crisp-chewy caramelized sugar crust that is almost black when it comes out of the oven and a smooth, soft, custardy center laced with vanilla. 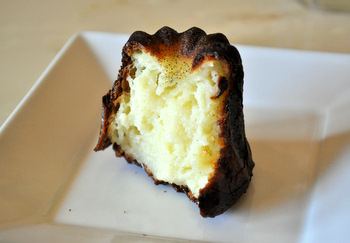 These were a perfect example of what a cannele should me. Chef Janvier told me that it took the customers a little while to warm up to these, as the dark caramel exterior proved to be a bit intimidating at first, but every time someone tried them they were hooked. They’re still made in very small batches so that they’re always at their peak when they’re sold. 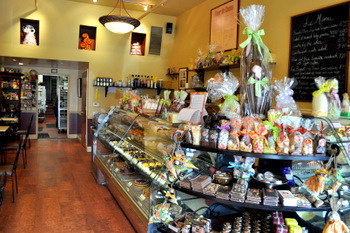 The shop is open Tuesdays through Sundays for breakfast and lunch, and takes orders for specialty desserts, cakes and chocolates in addition to the items on their regular menu. 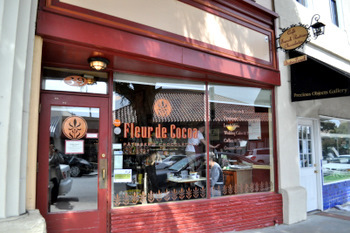 It may be a little off the beaten path for some visitors to the San Francisco Bay area, but Fleur de Cocoa is a fantastic place to stock up on French pastries and chocolate even if you have to go a little out of the way to get there. And if you live in the area, I can safely say that you’re missing out if you haven’t stopped by yet. 39 N. Santa Cruz Ave. 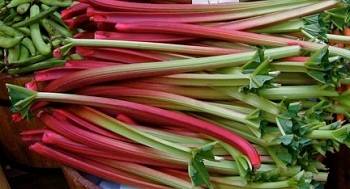 Previous PostPrevious What is rhubarb? What are chocolate wafer cookies? Looks lush. Wish there was somewhere like it where I live.